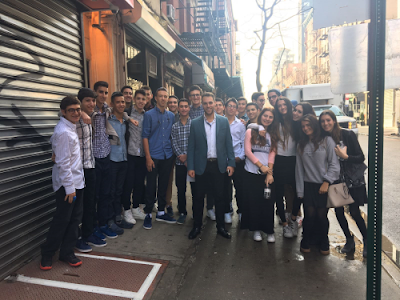 Last Week, Yeshvah of Flatbush students visited Misrahi Realty on NYC's Lower East Side through our Pathfinders Program. The students met with head agent Joe Safdie, who taught them the ins and outs of becoming a real estate agent. After the discussion Joe took the group on a tour of two of his showings, one an apartment building and the other commercial building, rented by the food company By CHLOE. Joe shared details on both of the showings and explained to the group his role as an agent in maintaining the buildings. Students enjoyed the tour and were eager to ask questions. This trip was arranged by Nancy Mizrahi (HS 2015) and Florence Dweck (HS 2015).